Do you remember the film Big starring Tom Hanks? Of course you do. 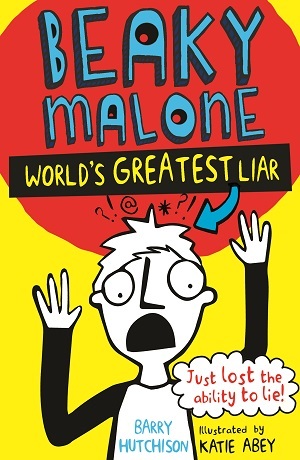 Then this new book, Beaky Malone, World’s Greatest Liar by Barry Hutchison, is for you. But instead of turning Big, when Beaky Malone steps into the truth-telling machine at the mysterious Madame Shirley’s Marvellous Emporium of Peculiarities, he stops being able to lie, which is shocking, as he’s quite in the habit of telling fibs. With hilarious illustrations from Katie Abey, and amusing antics care of writer Barry Hutchison, this is a delightfully entertaining comedy for 8+ years. I’m delighted to welcome author Barry Hutchison onto the website today, with a *true* story about Barry’s lies…..
There’s nothing wrong with lying, you know? In fact, I’d go so far as to say that without lying, our entire civilisation would fall apart in a matter of hours. We lie constantly. When I meet someone for the first time, I say “Pleased to meet you.” But if truth be told, I don’t yet know if I’m pleased to meet them or not. They might be a massive racist. Or a serial killer. Or have just gone for a poo then didn’t wash their hands – one of which I just shook. From “what a beautiful baby,” to “no, that outfit definitely doesn’t make you look fat,” our lives are a non-stop whirlwind of fibs, tall tales, and shocking untruths. Lying is the glue that holds our civilisation together, and the grease which keeps the world’s wheels turning. Looking back at all the lies I’ve told over my life, though, there’s one that stands out. One whopper that stands head and shoulders above them all. One lie so unbelievable, so nonsensical, and so utterly, completely pointless, that the thought of it still makes me come out in cold sweats. I was twelve. Thirteen, maybe. My family was off on holiday at a caravan park outside Aberdeen in the North East of Scotland, and I had just fallen in love for the first time. OK, that’s possibly an exaggeration. I had just seen a girl of around my age who, for the first time ever, didn’t make me think, “ew, girls,” and want to run away. Basically, to my young, adolescent mind, that meant I was looking at my future wife. I’d spotted her sitting on a swing in the middle of the rather desolate caravan park, and decided there and then that I was going to go over and talk to her. I wanted to be sure I impressed her, though, and – being the 80’s – if there was one thing I’d learned from movies, it was that girls loved a man in sunglasses. As luck would have it, the campsite shop had a pair of Top Gun style mirrored aviators on sale, so I forked out some of my holiday money, slipped on the shades, then strolled over to work my charm. The girl looked up as I approached. She raised a perfect eyebrow and I felt my young heart skip a beat. “Yep,” I replied, my throat suddenly dry. “I like your sunglasses,” she said. Yes! I almost punched the air in delight, but stopped myself in the nick of time. I had to play this cool. “Thanks,” I said, shrugging as I sat on the next swing over. “Why are you wearing them?” she asked. That one caught me off guard. “Hmm?” was all I could think of to say. The girl looked up at a sky that was heavy with dense, grey cloud. Mid-August or not, this was the North East of Scotland, and sunshine was a rare sight indeed. My stomach tightened. My mouth opened, flapped about for a bit, then closed again. She had raised an excellent point. I knew why I was wearing sunglasses – to impress my future wife – but I couldn’t very well tell her that without making myself sound like a maniac. “I, um, always wear sunglasses,” I blurted. I snapped my mouth shut. Oh God. Why had I said that? What was I thinking? I hesitated, trying to think of a way I could backtrack over the past few seconds of conversation and find an escape route. For the life of me, though, I couldn’t think of one. I had no choice. I had to press on. The girl rocked on her swing, considering this for a few seconds. “Why has no-one ever seen your eyes before?” she asked. I’m not sure why I said what I said next. Panic, probably. The clammy realisation that my lies had led me into an inescapable dead end, and that only by taking my fibbing to an entirely new level could I hope to somehow break through to the other side. The girl blinked. She stopped swinging. “You haven’t got any eyes?” she gasped. “Uh… Yep. I mean nope. I mean… that’s right,” I said. “Apparently not,” I said, in something that was more a whimper than anything else. She struck like a cobra, swiping the shades off my face. Our eyes, to her surprise, met. “Yes you do!” she said. I should’ve laughed it off, of course. I should’ve said, “Of course I’ve got eyes, I was just having a laugh,” but I was too far gone, now. Too heavily invested in this strange alternate reality where I, a twelve-year-old boy from the Highlands of Scotland, compensated for having no eyes by wearing an oversized pair of Top Gun style sunglasses, yet could still somehow walk confidently across a caravan park in order to strike up a conversation with someone who had been sitting in complete silence. There was no turning back. I jumped up from the swing. I waved my hands in front of my face in what I hoped was a convincing display of disbelief. Then I scrambled inside, bolted into the tiny little room where my miniscule bed was, and locked the door. Next morning, when I opened the caravan door, I found my sunglasses sitting on the step, but I didn’t see that girl again for the rest of the holiday, or any day since then.